Help us save Nantucket Lightship / LV-112, a National Historic Landmark and preserve her in perpetuity. LV-112 is the world's most famous and largest U.S. lightship ever built. In this challenging economic climate, regarding charitable donations, every little bit helps, even if you can only donate a $1.00, any amount you are able to contribute would be greatly appreciated. The United States Lightship Museum is a 501(c)3 non-profit organization. Charitable donations are tax-deductible to the full extent allowed by law. Your support and commitment to preserving one of America's most unique historic landmarks, would also be valued. With your support, LV-112 can continue to educate and serve future generations as a institution of lifelong learning. Preserving this United States Historic Landmark is an important part of our nation's heritage. You can forward your contribution electronically on our website using PayPal or if you prefer, please make your check payable to: USLM Nantucket / LV-112 and mail it to: United States Lightship Museum, Inc., P.O. Box 454, Amesbury, MA 01913. Thank you! Even though Nantucket Lightship/LV-112 is a National Historic Landmark and National Treasure, the historic vessel 's existence is still at risk. Approximately 50% of LV-112's restoration has been completed. However, there is still much more that needs to be accomplished in order to finish stabilizing the ship from further corrosive deterioration of the seawater environment. Our next primary goal is to restore LV-112's plumbing and heating systems (currently not operational). Once this has been accomplished we can schedule our planned educational programs for students and youth groups on a year-round basis. Your contributions will help us achieve our fundraising goals and save this precious National Treasure for everyone to learn from and enjoy. Corporate sponsorships of LV-112’s restoration and preservation are also welcome. For more information, please contact us. Every little bit helps! Even if you can only afford $1.00, any amount you are able to contribute would be greatly appreciated. The United States Lightship Museum (USLM) is a 501(c)3 non-profit organization. Charitable donations are tax-deductible to the full extent allowed by law. If you prefer to mail in your contribution instead of donating electronically on our website, please make your check payable to: USLM Nantucket / LV-112 and mail it to: United States Lightship Museum, Inc., P.O. Box 454, Amesbury, MA 01913. Thank you! 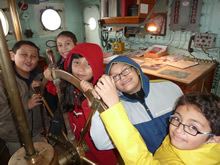 Everyone who donates $25 or more will become an automatic member of the U.S. Lightship Museum, receive membership privileges to other Council of Maritime Museum (CAMM) members and the USLM periodic eNews newsletter via email on the Internet. 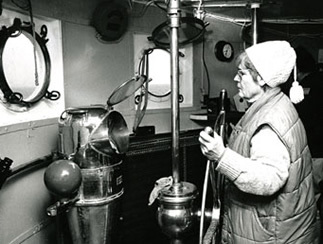 A volunteer at the helm of LV-112, while underway (c. 1990 - Photo, courtesy of Don Yeskoo).